Posted by Fritz in Humor, Yachts and other things that float. 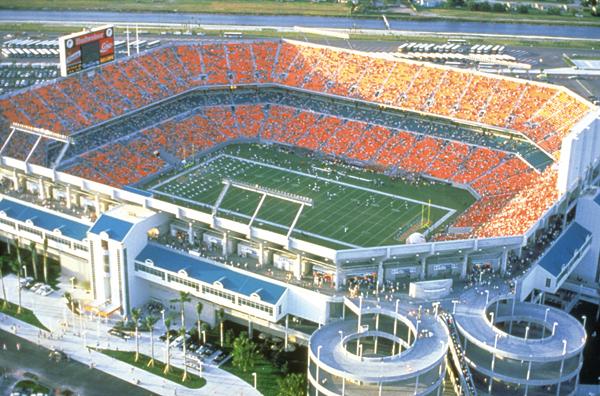 Has any other football stadium been as schizophrenic as the one the Miami Dolphins play in? Since 1987, the stadium has sported seven different names—the most recent happening just last week. Sun Life Financial of Canada purchased the rights to rename the stadium—Sun Life Stadium, just in time for the big game. Wayne ‘Blockbuster, Waste Management, AutoNation’ Huizenga purchased the team and stadium from the founding Robbie family outright in 1993. The stadium was called Joe Robbie Stadium back then. In 1996 Huizenga sold the naming rights to the apparel company Pro Player- thus becoming Pro Player Park. The next year they changed ‘Park’ to ‘Stadium’—Pro Player Stadium. It stayed that way for six years until Pro Player apparel went bankrupt. The stadium’s name was changed to Dolphins Stadium. That lasted a year until somebody realized that pluralizing dolphin was incorrect. Dolphin Stadium remained s-less for the next three years until another corporate sponsor could be found. In the meantime Stephen M. Ross had purchased 50% of the team and stadium from Huizenga. In January of ’09, he plopped down another billion and secured 95% of the organization. With total control, he set about selling the naming rights once again. Ross brought in Gloria Estefan and Marc Anthony, along with Venus and Serena Willams, as minority owners of the team. 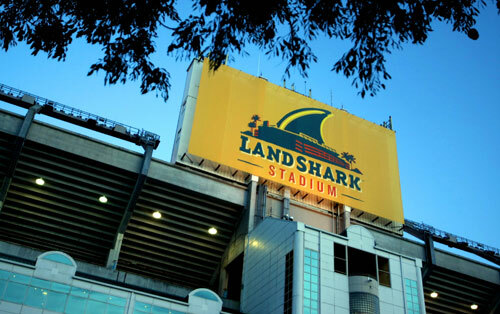 He also signed a deal with Jimmy Buffett for the team’s stadium naming rights— Land Shark Stadium after Buffet’s newly launched beer. So tonight the NFL’s Pro Bowl will become the first professional football game played in the stadium that has had seven names in it’s 23-year history. The Super Bowl is next week. I bet they can squeeze in another name change by then.